Los Angeles Unified is increasing supports for students and their families as new data reveal more about LGBTQ students’ emotional harm in school. 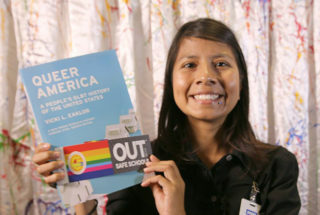 According to data presented at last week’s school board meeting, 56 percent of LGBTQ high schoolers in the district have been bullied at school, and 60 percent have seriously considered suicide. 66 percent of high school students felt so sad or hopeless that they stopped doing some usual activities. 46 percent of middle schoolers and 44 percent of high schoolers purposely hurt themselves. 37 percent of middle schoolers and 60 percent of high schoolers have seriously considered suicide. 26 percent of middle schoolers and 34 percent of high schoolers have attempted suicide. 28 percent of middle schoolers and 56 percent of high schoolers have felt bullied at school. 23 percent of high schoolers have experienced sexual violence. “Despite our best efforts, LGBT students across the country and in our district continue to face a number of risk factors, so in June the board passed” the resolution, which “underscored every student’s right to be welcomed and affirmed,” Beutner said. Public displays will commemorate October as LGBTQ History Month, when the district plans 12 events, including a think tank with parents who are raising LGBT students. The Affirming School Project is increasing LGBTQ competency trainings for a broad cross-section of students, parents, school site faculty, and staff, and community partners/organizations to educate them on what the school experience is like for LGBTQ students and parents. 100 percent of single-occupancy restrooms have been designated as all-gender with signs that identify them. A new centralized online platform lists resources; the site is being used internationally. LAUSD is revising enrollment forms and student ID’s to be more affirming of gender-diverse students based on 2017’s state legislation SB 179 Gender Recognition Act, which starting Jan. 1, 2019, will have “non-binary” as an alternate to male or female on driver’s licenses.